′ Macaroon…schmack-a-roon, give me a graham cracker and butter cream frosting any day. When my mother made a birthday cake, she took it seriously (as did her kids). Layered and lovely, the cake bedecked and bedazzled a cake plate in a fashion worthy of celebrating someone’s arrival into the world. Her Rococo scrolls, fanciful flowers and cursive loops of frosting in baby blue, egg-yolk yellow and spring green would have made a Faberge′ egg jealous. In the fridge, buried behind the milk carton and orange juice jug, hid the collateral cake treasure: extra butter cream frosting. The small tub held a confectioner’s rainbow of frosting blobs —blobs of color mushed, squished, and spread to fit in the container and still allow for the important Tupperware burp. The stash was destined to grace the perforated wafers of the Graham Cracker, a sandwich cookie like no other. The year was 1964 and from that day on madeleines, macaroons and moonpies took a back seat to this homemade cookie hybrid. Cream cheese, butter cream frosting is about as good as it gets. (Nine out of ten graham crackers agree.) This dreamy, frosting is my favorite (for now) and one that adorns most of my layer cakes (and some of my waistline). The cream cheese, butter cream frosting is perfect for a decadent layer cake or simple graham cracker cookie. It's especially good on a coconut cake. Using electric mixer with paddle attachment, beat room temperature cream cheese on medium speed until fluffy. Add powdered sugar cup by cup, mixing thoroughly until smooth. 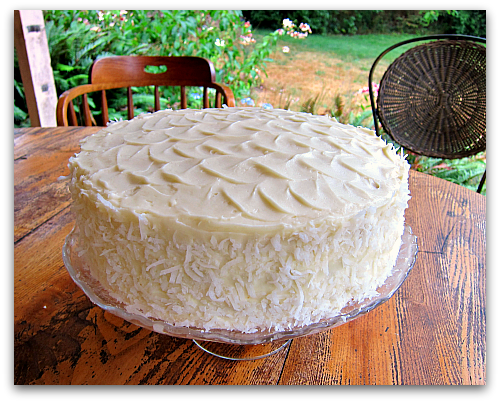 Here’s the mother ship, a coconut cake destined for an island celebration. With a generous tub of icing left, it’s a little easier to let go of the cake. Graham crackers are standing by for any drop-ins or cookie emergencies. SO glad someone else loves a good graham cracker/frosting cookie… I grew up with them, and am training up my granddaughters now! Tom, The cake is a showstopper for sure! Did you make it or did your Mom? Beautiful! Pam, I made it. It’s a coconut cake, your basic frosted dairy flour bomb. Nothing “lite” about it. I’ll post the recipe sooner than later, just need to make it again and take some pics. Good point Lucy, I better stock up on graham crackers and eat less frosting from the tub should a boatload on new friends descend upon me from the ferry dock. And I am an equally opportunity cake maker and eater, cake mix or scratch, I savor them both especially with good company and ice cream. My mum also ‘oft times had the kitchen stocked with the GC & I treat you describe. She’d make them ahead then tuck them in a plastic bag with a slice or two of bread to soften the GC. love your prose and that cake looks magnificent! grew up on grandmother’s pound cake and ma’amoul though and that amount of sugar would be a tad stiff in my book, but hey, it does look mighty creamy. Thanks for sharing the fun and memories. My mom would then stuff said sandies into the freezer for a hot afternoon treat. Try chocolate or mocha icing. You might switch…..
Wendy, I’m hearing a lot about using chocolate icing, how could I have missed this option. Time for me to catch up! Bring on the cocoa! 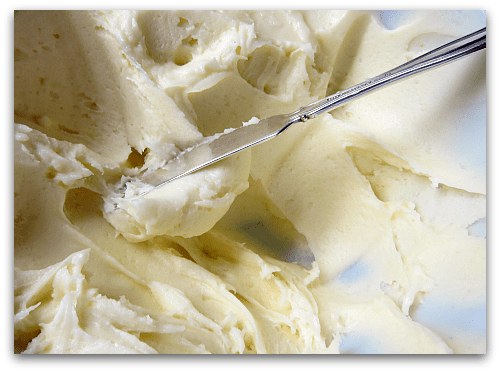 Great frosting, I alternate between this cream cheese frosting and a pure buttercream. Do you have cucumbers yet? I’d love to try your pickle recipe. Yikes Elizabeth, no cucumbers yet, still a little early for my cukes. But I will post my pickle recipe, or did I already? Ruh-row, there’s goes the memory. I’ve had cucumbers for a few weeks, but I’m just starting to get Boothby’s Blonde. This is my first year growing Boothby’s Blonde and I really like it, may be the only one I grow next year. What are your favorite varieties? Maybe you have posted a pickle recipe, I’ll search your site, I do remember a post about sour pickles, but I don’t know if it included a recipe. Elizabeth, you’re right, I didn’t post a pickle recipe, but will soon! Thanks for the Boothby’s Blonde tip. Hi Tom, I can taste it from here. Now days being a diabetic I don’t have the luxury of butter creme frosting on anything but I do take gram crackers with a light spread of almond butter and sugar free chocolate fudge ice cream topping. Not the same I know but you gotta do what you gotta do. David, glad to see you found worthy substitutes. I’ll have to give those a try; it would do me good to go a little light on the sugar as well. Truly gorgeous cake,Tom. Wondering how you got the coconut just on the sides and with such a perfect edge? It looks so professional and cool for a summer treat! I start by gently placing the coconut on the top edge by hand. Much of it will fall to base of the cake and the cake plate. Once the top rim is complete, I take a butter knife and again gently take the loose coconut at the bottom of the cake plate and lift it up and tap it on the side of the cake until I meet the top ring of coconut. Works pretty well. Lovely cake! But ,what I really wanted to tell you was that I FINALLY FOUND SOME FIGS for your fig / ginger jam recipe from last Fall. Six half pints just came out of the water bath. Saving the extra 1/2 pint for immediate gratification. I was given about 6 green (Kodata? Desert King?) and then made a 30 mile round trip to Foley’s in Maple Valley for the rest. They offered a variety called “Black Mission”, so I mixed 2 1/2 pounds of the dark with the lesser green variety. I also made my own candied ginger as per ATK. Used regular ginger, not the young stuff. It is quite nippy but I love the wonderful flavor. My only question is: Did YOU develop this recipe or tweak it from another? Because, I notice all the others have added lemon juice and use way less than the 2/3 cup ginger pieces that your recipe calls for. To me, the ginger is what makes this recipe so outstanding. I’m also curious as to the PH level in figs for our area and can’t really find any info regarding this issue. Can you enlighten me? Hi Carol, I’m tearing up, another fig lover! So glad you tried this recipe and made your own candied ginger, which to me seems always more fiery than the store-bought variety. I did make up that recipe in trying to recreate what I had tasted in Australia. I kept upping the ginger, because the jam I liked Down Under had a real kick to it, a ginger spark! And please forgive me, but yes, I usually do add the juice from one lemon or lime. Sometimes I forget, and it really doesn’t seem to effect the outcome that much; I find it takes longer to thicken the jam without the lemon juice. I’ve updated the recipe to add the lemon juice, and again not for safety but to add in thickening the jam. Here’s a list of pH for certain fruits and foods: http://www.pickyourown.org/food_acidity_ph_list.htm. Enjoy the jam! I checked your referenced website on the PH of figs. It seems they are not that acidic; so, I’m wondering if I shouldn’t keep the jars under refrigeration since I didn’t add the lemon juice to bring up their acidity. Call me a chicken. Also, I found an article written about a guy (Denny McGaughy – retired environmental biologist) who lives in Elma, WA (30 miles west of Olympia) who is a fig aficionado. This article, written a few years ago, appeared in the News Tribune and explains his fondness for this amazing under-appreciated fruit AND gives some interesting history on figs. I’ll shoot you the link. I could be wrong, but with such a high sugar content, I don’t believe the lemon juice plays that an important role in preservation. It does keep the fruit from discoloring usually, but its big purpose is to help amp up the natural pectin in the fruit and thicken the jam. Refrigeration is a good idea if you have storability concerns. But Carol, I bet your fig jam will be devoured before an autumn leaf falls. Thanks for the Olympian fig article. Hey Tom ! 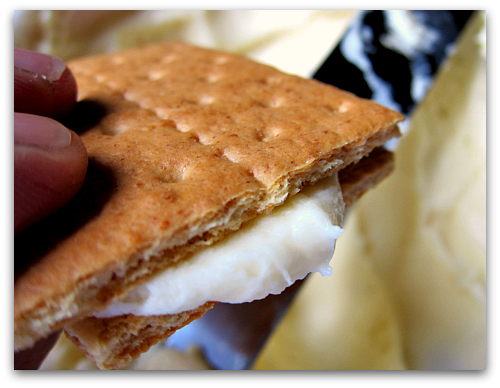 I thought I was the only one who made sandwiches with graham crackers and chocolate frosting … Trying to quit. And we have a fig tree too ! Big yellowish=purple figs ..
Oh Tom I just love you! I wish we could be neighbors and chase deer together! I love as do my kiddos gram-crackers and icing!!!! This recipe is going on my homemade carrot cake. Thanks Stacey, I am feeling the love 😉 This icing is very very comfortable, and at home on a carrot cake. Thanks for the recipe, Tom. Cream cheese frosting is the best. Will have to try frosting and graham crackers. My new love is Nutella between vanilla wafers. So good! uh oh, toad girl, nutella, eh…I better check this out for myself. Beautiful cake, Tom! And isn’t wonderful when there’s left-over frosting? I recently made a carrot cake with much more cream cheese (and cream of coconut) frosting than was needed. I happened to find one chocolate cake layer in my freezer (from about a year ago! ), and that left-over frosting transformed the cake layer into a dreamy dessert! Eileen, the original recipe was double this amount. I cut it in half and still had enough frosting for ample graham cracker cookies. Now about that cream of coconut frosting? Is the recipe on your site? Whenever I see a graham cracker, all I could think of is Crema de Fruta. But this looks just as yummy. I would like to thank you for sharing this very delicious recipe. I used it on my daughters Red Velvet Birthday cake. It was a huge success! The kids at the party absolutely loved the graham crackers as well!